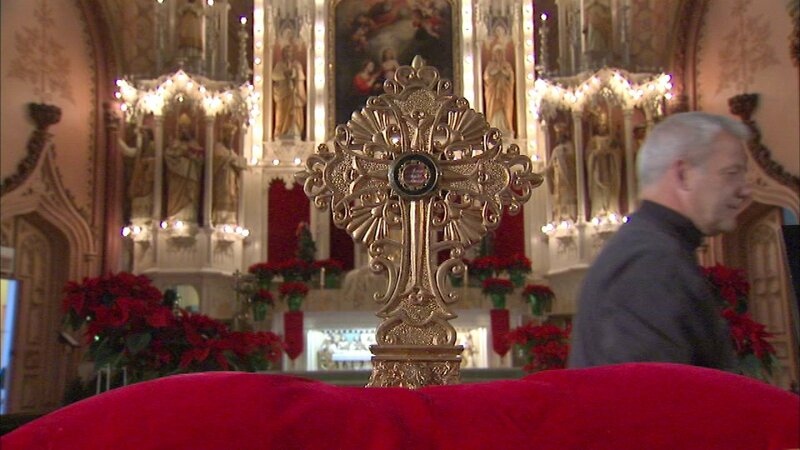 CHICAGO (WLS) -- Holy relics, including a piece of the cradle believed to have once held baby Jesus, will be on display Sunday at a Chicago church. The relics will be on display from 9:45 a.m. to 6 p.m. Sunday at Holy Family Church, 1080 W. Roosevelt Rd., on the city's West Side. The other relics that will be on display are a thread from St. Mary's veil and a piece of St. Joseph's cloak. The Vatican has confirmed that St. Helen of the Cross collected all of the items. "We know they were brought to Rome in the 5th century so right then and there they were authenticated as being precious items," said Father Michael Gabriel, of Holy Family Church. Other items that will be on display include artifacts, vessels, chalices and vestments that were part of the church here in the 1800s. The church is also celebrating the 25th anniversary of its global effort to raise $1 million to save it from demolition in 1990.